Let’s see a show of hands: how many of you grown-up adult kinds of folks 1) know what this conical depression is and 2) have been entertained thereby in your oh so distant childhood past? Get’em up there and let me see. Now: how many of your children would know? Your grand children? Is the number diminishing with each generation? My guess is YES. Shame on us. So this is a doodlebug trap. 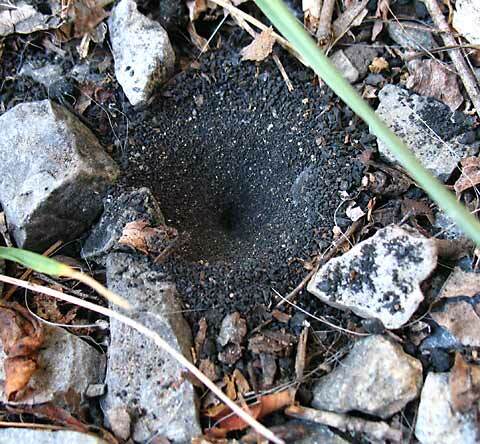 An antlion lives at the bottom. And the ferocious creature can sometimes be fished out of its lair by “doodling” with a pine straw. You’ve done this. Right? No? It’s not too late! And everything you always wanted to know about Doodlebugs–including videos–is here. Now, go ye into the world with straw of pine and doodle your way to enlightenment. Friday it is, grasshopper, and pleased I am. i’ve never in my nature-loving life seen one of those. I know what a doodle bug is…but not an antlion. Maybe cause I was a girl….I didn’t explore the bug world as much as boys….or maybe I just wasn’t in the right place at the right time….very facsinating and thank for all the great nature clues and observations! Ah yes, I remember those! And I suppose I count as a grown-up adult type person, even though I seem to be getting less mature as I age. I spent many hours as a kid on hands and knees in the car shed trying to catch doodlebugs. With our world of concrete and asphalt, it’s getting harder to find them, but I have managed to introduce our six year old to the ‘sport’. It’s an ant lion – I used to love feeding it ants – is there some thing wrong with me? I learn something new every time I visit your site, Fred. This was fascinating! Thanks for sharing! I looked at most of the videos. They were lots of fun. Thanks! I like it – “doodling my way to enlightenment” that is.